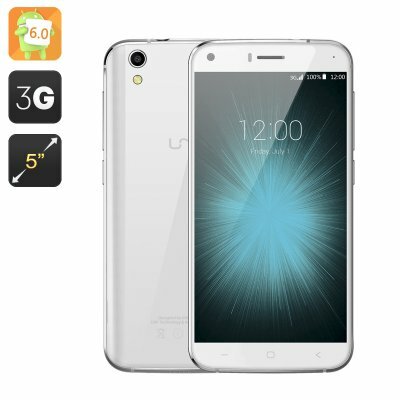 Successfully Added HK Warehouse UMI London Smartphone - Android 6.0, Smart Wake, 5 Inch IPS Screen, Quad Core CPU, Dual T2X-1 Glass (White) to your Shopping Cart. The UMI London Smartphone is a sleek and modern looking budget phone that has been designed for excessive every day use. Its exquisite aluminum alloy frame is light in weight yet brings great strength and the display features a unique dual glass protection which has a double layer of toughened glass that has been surrounded by 3M double coated foam tapes. These protection features guarantee that your phone along with its display is well protected from any damage. A highly valuable asset in today’s busy world where Smartphones should be able to take a hit. For those of you who enjoy playing games, watching video’s, or browse the web - this toughened Smartphone comes with a 5 Inch Sharp IPS display that brings 720P resolution and allows you to enjoy all your favorite media files in stunning quality. The UMI London cell phone is furthermore equipped with a MTK9580 Quad-Core CPU and features a Mali 400Mp GPU. With this hardware this Smartphone is guaranteed to handle all your daily needs as well as tackle most games and apps with relative ease. With its 2050mAh removable battery this budget Smartphone brings along hours of usage time for you to browse the web, watch a movie, play games, or listen to your favorite music tracks. The UMI London Smartphone holds up to two SIM cards that, thanks to its double IMEI number, can both be activated simultaneously. From now on you can easily combine your work and private life as you will be reachable on two different numbers while using just one cell phone. Additionally both SIM cards can be connected to different 3G networks at the same time, guaranteeing that you will always be connected. With its Android 6.0 Marshmallow OP this phone features a great user interface that delivers a smooth user experience. Additional features of this budget cell phone such as its smart wake and gesture sensing features further enhance the user experience as now you can simply open any apps straight from your locked screen and navigate through them without actually having to touch your display. The UMI London Smartphone is the perfect budget phone for those of you who are looking for an entertaining yet tough device that is capable of dealing with the harsh environments of everyday life. The UMI London Smartphone comes with a 12 months warranty, brought to you by the leader in electronic devices as well as wholesale Android Smartphones..